Unfortunately, I don't own a device capable of playing the game in question, called PiyoPiyo Quest. Those of you who actually own an iOS device or three and enjoy a good puzzler, though, should hunt it down and give it a go. After all, it was made by Kotaro Yoshida, the same man who gave the world Half-Minute Hero, it features some lovely sprite work and it looks to play a bit like that other mobile puzzler all the kids seem to be talking about these days, Puzzle & Dragons. "You fight monsters by touching the different panels you can see above. 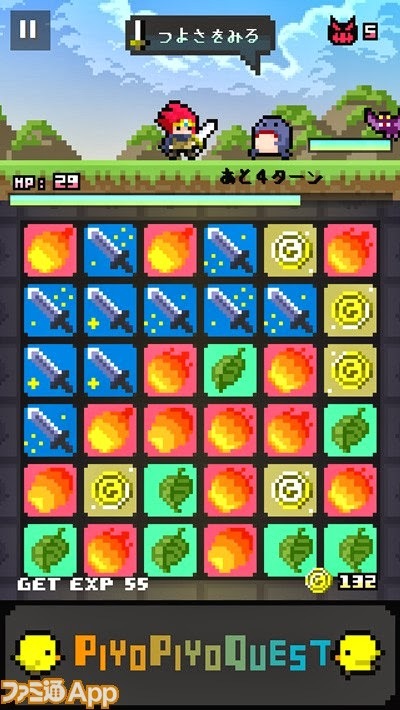 "The sword panels make Crest [the game's protagonist] attack with his sword, the fire ones make Crest cast magic, the leaf ones make Crest recover HP and the gold ones give you money, which you can use later to temper Crest's equipment and deal more physical/magical damage or increase his defense. "The more panels you group together the better their effects. For example, if you group four sword panels, Crest will attack four times and so on." Go here to read more of Goli's impressions. Should any of you pick up PiyoPiyo Quest anytime soon, would you please share your impressions of it in the comments section below? I just tried hunting this down, but it's not available to American audiences, apparently. What a bummer. Also, I know it's a stupid point to make, but I believe the game it's like is "Puzzle and Dragons". Although I've seen it called any number of plurals in al sorts of places...so maybe I'm wrong. If this ever gets made in English, I'm all over it! Oooh, I'll definitely have to pick this up! Half Minute Hero is my all time favorite PSP game!